Samaei, F., Bashiri, M., Tavakkoli-Moghaddam, R. (2012). A Comparison of Four Multi-Objective Meta-Heuristics for a Capacitated Location-Routing Problem. Journal of Industrial and Systems Engineering, 6(1), 20-33. Farshid Samaei; Mahdi Bashiri; Reza Tavakkoli-Moghaddam. "A Comparison of Four Multi-Objective Meta-Heuristics for a Capacitated Location-Routing Problem". 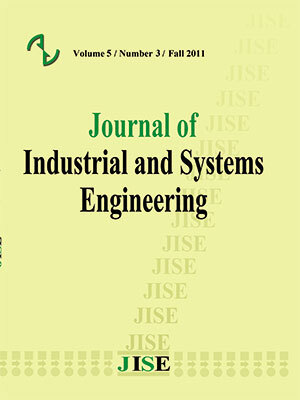 Journal of Industrial and Systems Engineering, 6, 1, 2012, 20-33. Samaei, F., Bashiri, M., Tavakkoli-Moghaddam, R. (2012). 'A Comparison of Four Multi-Objective Meta-Heuristics for a Capacitated Location-Routing Problem', Journal of Industrial and Systems Engineering, 6(1), pp. 20-33. Samaei, F., Bashiri, M., Tavakkoli-Moghaddam, R. A Comparison of Four Multi-Objective Meta-Heuristics for a Capacitated Location-Routing Problem. Journal of Industrial and Systems Engineering, 2012; 6(1): 20-33. In this paper, we study an integrated logistic system where the optimal location of depots and vehicles routing are considered simultaneously. This paper presents a new mathematical model for a multi-objective capacitated location-routing problem with a new set of objectives consisting of the summation of economic costs, summation of social risks and demand satisfaction score. A new multi-objective adaptative simulated annealing (MOASA) is proposed to obtain the Pareto solution set of the presented model according to the previous studies. We also apply three multi-objective meta-heuristic algorithms, namely MOSA, MOTS and MOAMP, on the simulated data in order to compare the proposed procedure performance. The computational results show that our proposed MOASA outperforms the three foregoing algorithms. combined location-routing problem. Computers and Operations Research 32; 407–428. problem. European Journal of Operational Research, 179; 968-977.
for the Capacitated Location-Routing Problem. Computers and Operations Research 38; 931-941.
routing problem with a metaheuristic based on tabu search. Application to a real case in Andalusia. European Journal of Operational Research 177; 1751–1763. Deb, K. (2001),Multiobjective optimization using evolutionary algorithms. Wiley, Chichester, UK. location-routing problem. Computers and Operations Research, 37; 1912-1923. Lin C., Chow C., Chen A. (2002), A location-routing-loading problem for bill delivery services. Computers and Industrial Engineering 43; 5–25. future research directions. European Journal of Operational Research 108; 1–15. GRASP complemented by a learning process and a path relinking.4OR 4; 221–238. Prodhon C. (2011), A hybrid evolutionary algorithm for the periodic location-routing problem. European Journal of Operational Research 210; 204-212.
a bi-objective multi-depot location-routing problem solved by a multi-objective scatter search algorithm. Journal of Manufacturing Systems 29; 111–119. Tuzun D., Burke L. (1999), A two-phase tabu search algorithm to the location routing problem. European Journal of Operational Research 116; 87–89. innovations.Dayton, Ohio: Doctoral dissertation, Air Force Institute of Technology. and Operations Research 29; 1393–1415. the capacitated location routing problem. Computers & Industrial Engineering; 288–299. applications.Zurich: PhD thesis, Swiss Federal Institute of Technology Zurich. results. Evolutionary Computation 8(2); 173-195.